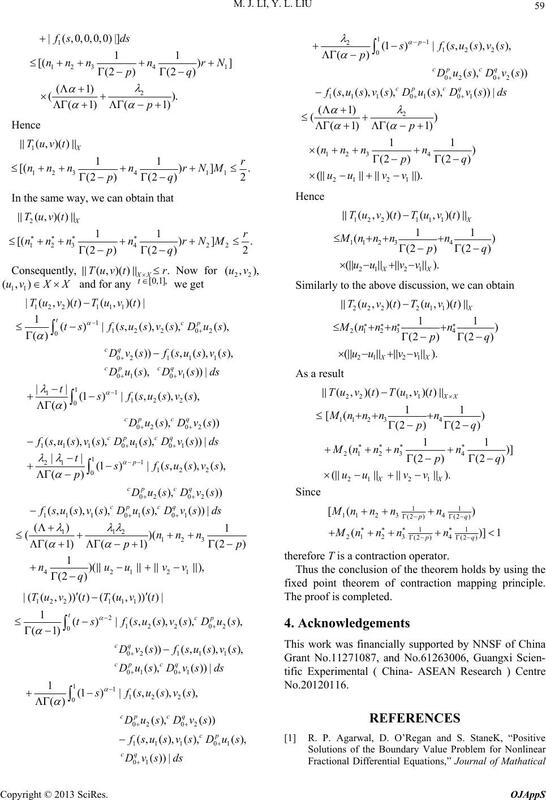 tive solutions for coupled systems are obtained. 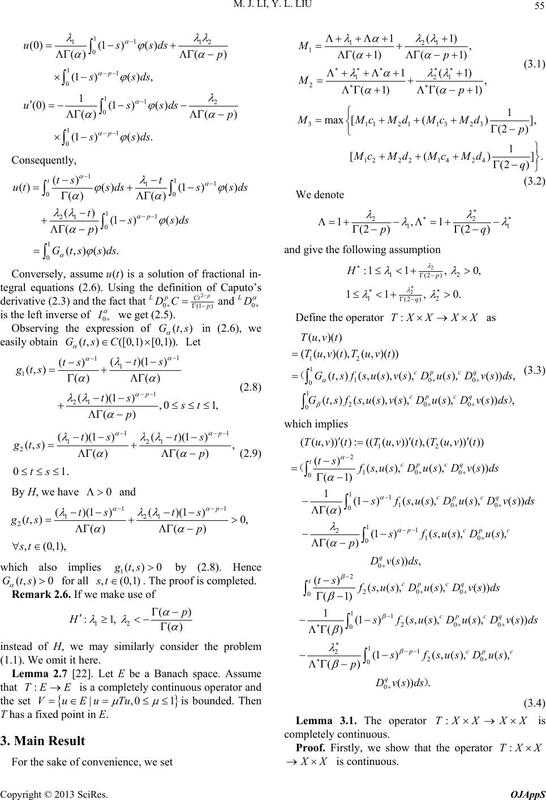 of fractional differential equations (see[2,3,25,26]). 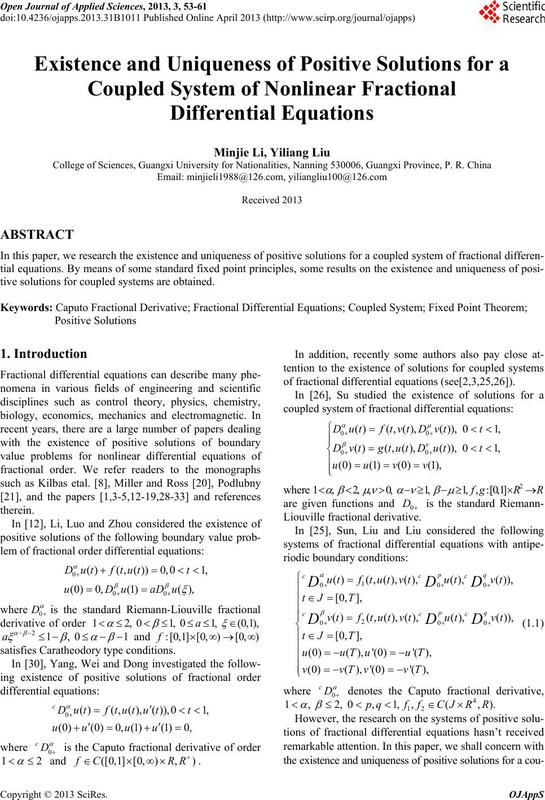 pled system of nonlinearfractional differential equations. 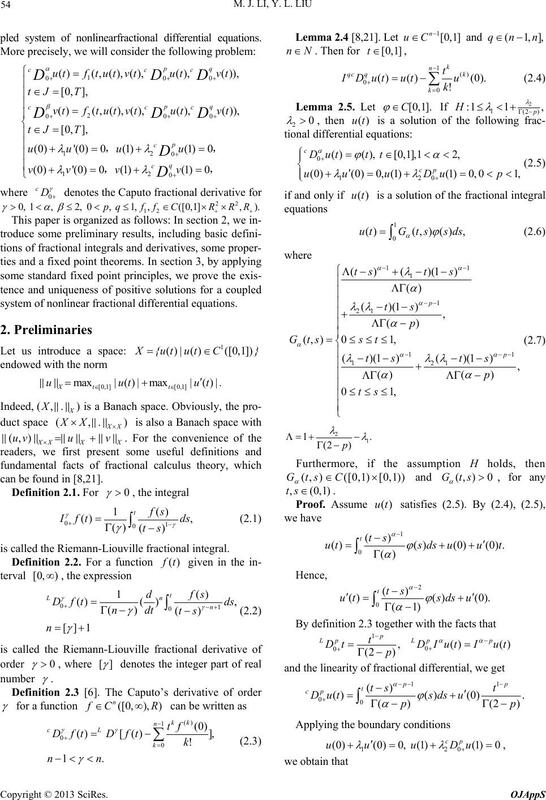 system of nonlinear fractional differential equations. can be found in [8,21]. is called the Riemann-Liouville fractional integral. (1.1). We omit it here. which implies that the operator T is uniformly bounded. Next we show that T is equicontinuous. continuous. The proo f is completed. are define d by (3.1). is bounded. Let , then. positive solution.The proof is completed. therefore T is a contraction operator. 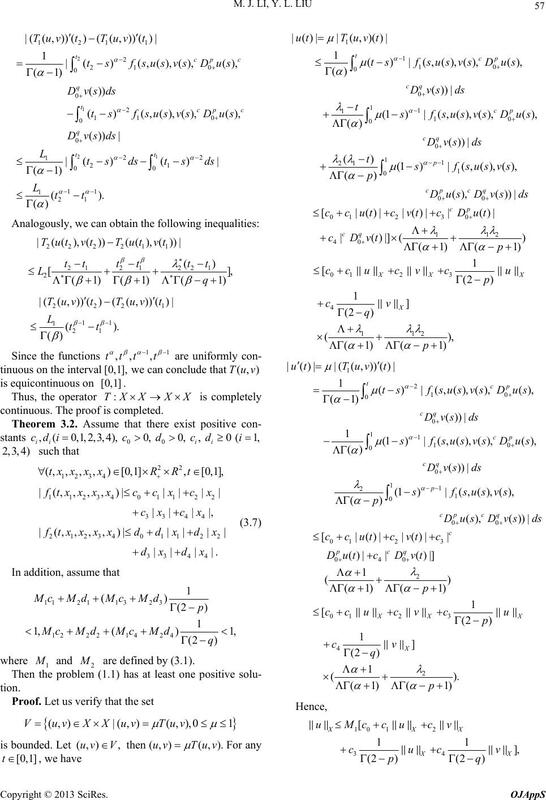 fixed point theorem of contraction mapping principle. Analysis and Application, Vol. 371, No. 1, 2010, pp. n, Vol. 150, No. 3, 2004, pp. 611-621.
cations, Vol. 311, No. 2, 2005, pp. 495-505.
ences,” Computer & Mathematics with Applications, Vol. 61, 2011, No. 2, pp. 367-373. 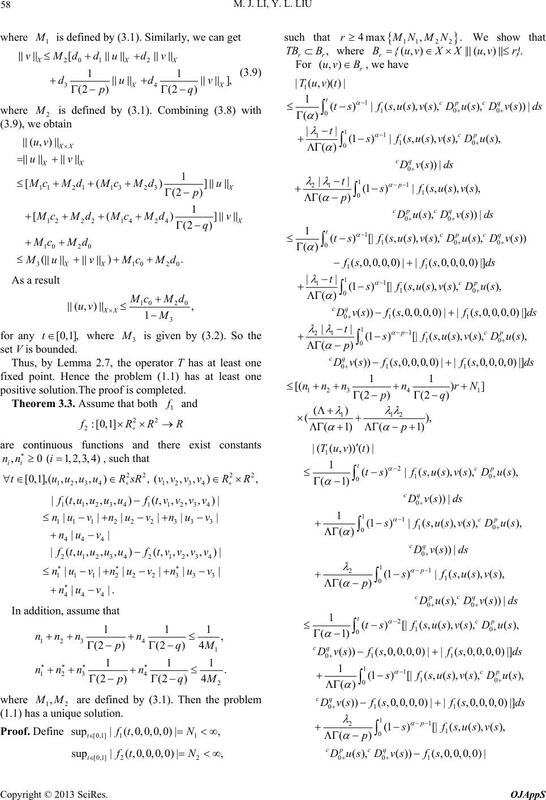 “Theory of Fractional Dynamic Systems,” Camb. Acad. Vol. 69, No. 8, 2009, pp. 2677-2682.
nlinear Analysis, Vol. 69, No. Dynamic Systems and Applications, Vol. 21, 2012, pp. 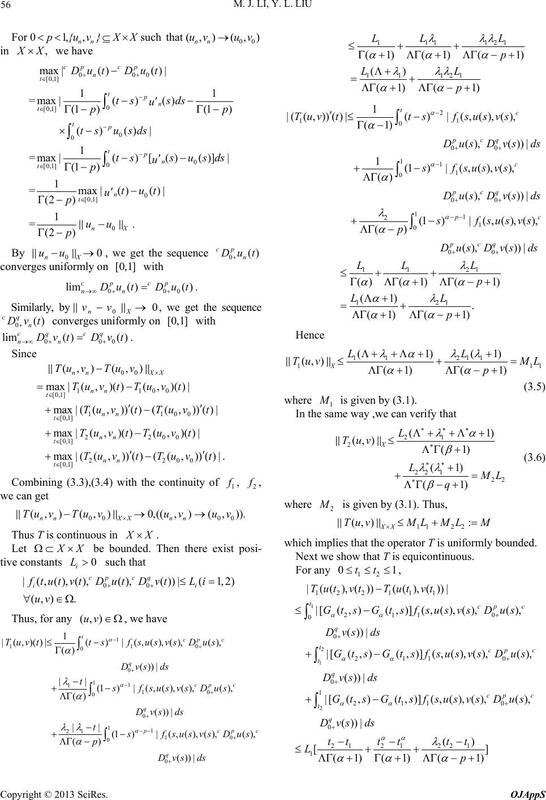 and Numerical Simulation, Vol. 18, No. 6, 2013, pp. 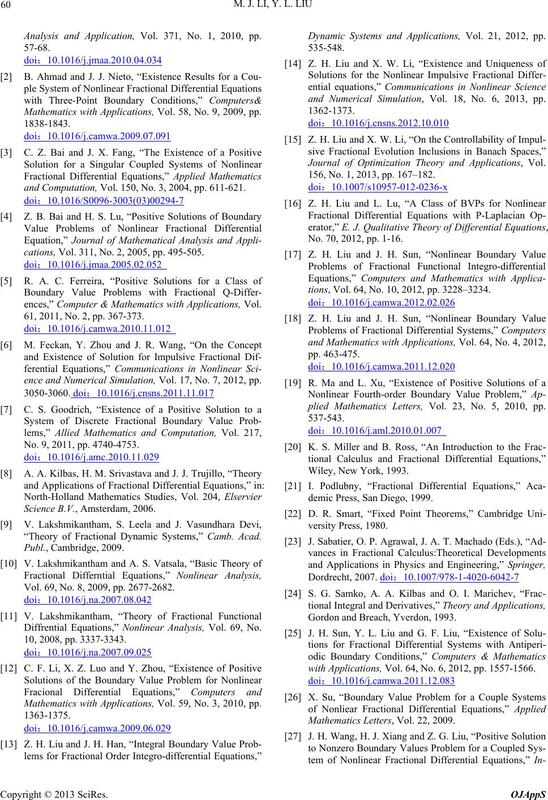 Journal of Optimization Theory and Applications, Vol. 156, No. 1, 2013, pp. 167–182. No. 70, 2012, pp. 1-16.
tions, Vol. 64, No. 10, 2012, pp. 3228–3234. plied Mathematics Letters, Vol. 23, No. 5, 2010, pp. demic Press, San Diego, 1999. S. G. Samko, A. A. Kilbas and O. I.
Gordon and Breach, Yverdon, 1993.
with Applications, Vol. 64, No. 6, 2012, pp. 1557-1566. Mathematics Letters, Vol. 22, 2009. Vol. 71, No. 10, 2009, pp. 4676-4688.
omputations, Vol. 2, No. 17, 2011, pp. 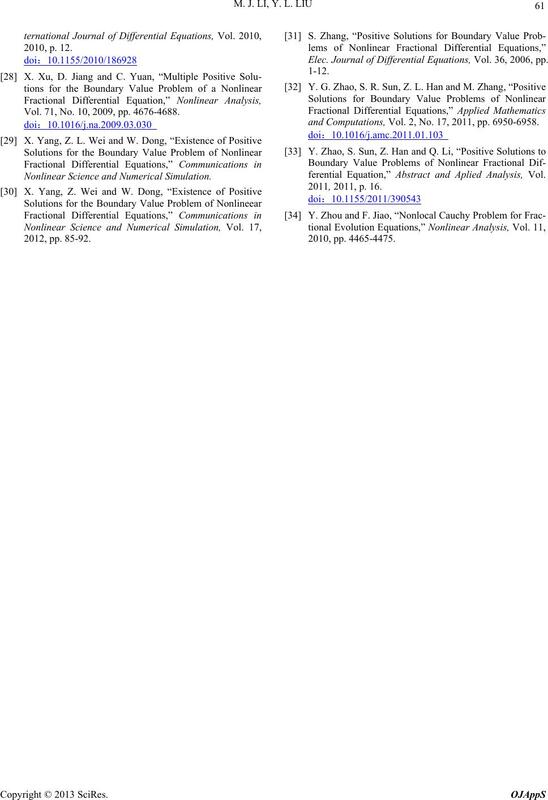 6950-6958.
ation,” Abstract and Aplied Analysis, Vol.